Designed and engineered by a retired Navy SEAL, ArmoRight is a lightweight body armor system for use in marine environments that combines protection from from handgun, rifle and shrapnel threats with neutral or positive buoyancy capabilities. Introduced by anti-terrorism training and preparedness specialists Tactical Solution Partners at the NAVEXFOR 2008 Symposium and Expo in Virginia Beach, the new vest also aims to deliver an adaptable, less cumbersome system that provides a superior fit in a lightweight package that delivers greater agility for the wearer. “We designed our personnel protective equipment for buoyancy, user comfort and performance in tight-quarters, shoot and move situations. 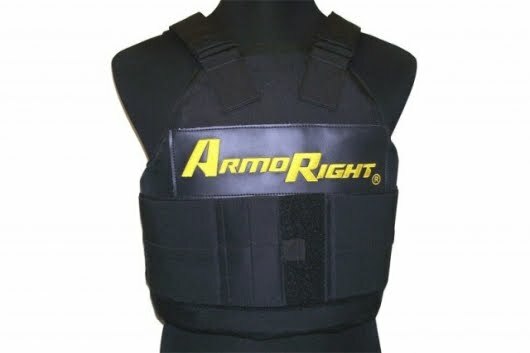 With all of the requirements placed on our soldiers, aviators and law enforcement personnel, the one-size-fits-all approach to ballistics protection equipment no longer works,” said Doug McQuarrie, Director of Technology and Marketing for the Company’s TSO division and designer of the ArmoRight body armor system.